Some of you probably have friends who are members of The Church of Jesus Christ of Latter-day Saints (often inadvertently referred to as the Mormon church). If you do have Mormon friends, you probably have a good idea of what they represent and how they stand out from the crowd. Some of you, though, may not know many Mormons and may even have some misconceptions about who they are and what they do. Today I’m here to tell you about the Mormon people I know, specifically the Mormon girls. Mormon girls have ambition and are driven to succeed. Because of their involvement in the youth programs of The Church of Jesus Christ, Mormon girls are already familiar with setting and achieving goals and serving those around them. They know what it means to be involved and to reach out to others. What Mormon girls learn in church is often translated to what they do in school and work. Mormon girls are encouraged by leadership in The Church of Jesus Christ to pursue education and develop important marketable skills. Mormon girls know the importance of learning and pursue that learning with zeal. One of the biggest outward characteristics of Mormon girls is their modesty. 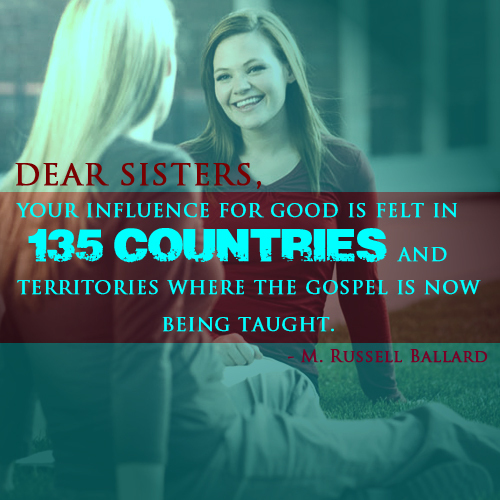 Mormon girls follow the counsel outlined in the For the Strength of Youth guidelines issued by The Church of Jesus Christ. Both boys and girls are instructed to wear clothing that is appropriate and respectful to their bodies. Young women especially are counseled to avoid looks that sexualize their bodies and show off their bodies inappropriately. The root of modesty is in knowing your identity as a child of God and understanding that your body is sacred. Mormon girls understand these doctrines and show it in the way they dress. Dressing modestly doesn’t mean that Mormon girls have to dress frumpy, however. Both Mormon girls and boys can dress modestly and keep up with many trends and styles. In fact, I’ve found that Mormon girls can execute trendy and attractive looks better than many who don’t make modesty a priority. One of the most important defining characteristics of Mormon girls is that they know exactly who they are: daughters of Heavenly Father. Every week on Sunday, Mormon girls stand and repeat the Young Women theme, which emphasizes their divine heritage as literal spiritual children of God. Because Mormon girls understand where they came from and who they are, they can better approach their challenges with perspective, faith, and courage. Knowing who they are gives Mormon girls lasting peace, even when life gets hard and unpredictable. The last thing I’d want you to think is that Mormon girls are perfect, because no one is perfect. Mormon girls can make mistakes just like anyone else. They can even make big mistakes. The beauty of the gospel of Jesus Christ lies in the promise of His redemption. We will all make mistakes, even those of us who have faith in the Savior, and we can find peace in the Redeemer’s promise to give us a fresh start. Perhaps that’s the best thing Mormon girls know: they know that they can be forgiven for their mistakes and start over, because of the grace of Jesus Christ. Mormon girls are different. Maybe you’ve noticed. What makes them different isn’t necessarily how they dress or how they spend their free time, but rather the most important thing that makes them stand apart is their knowledge that Jesus Christ lives and that He saves.